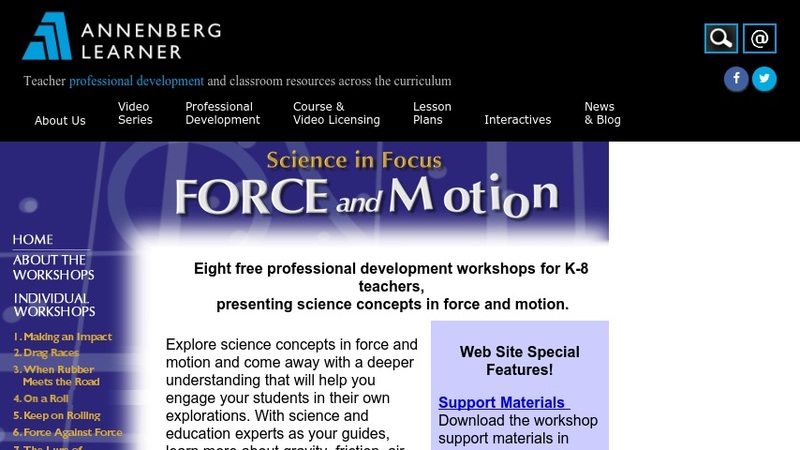 These eight free professional development workshops for K-8 teachers present science concepts in force and motion. Each workshop is structured around a one-hour video that features footage of a complete science lesson by a master teacher. As each lesson unfolds, science and education experts provide commentary to expand on key points. Graphics, animations, and video demonstrations reinforce with background information about gravity, friction, air resistance, magnetism, acceleration, and more. The workshops are designed so that teachers come away with an understanding that will help them engage their students in their own explorations. This resource also includes a series of self-tests to gauge understanding. The workshop videos may be viewed at no cost online. Registered users may also participate in forums and Teacher Talk email lists. DVD's are available on the website at an additional cost. Editor's Note: Teachers who participate in the entire workshop series are eligible for two graduate credits from Colorado State University (tuition applies). See Related Materials for a link to course enrollment information.